Wooden flooring installation cost 2019? Wood flooring looks great in any home and doesn’t have to break the budget either. Find out how much wood flooring costs here. There are many different types of wood flooring such as wood-walnut, ash, bamboo, oak and many more. With wood flooring available for all budgets anyone can afford the look of natural timber floors. Hardwood flooring prices are the highest followed by engineered wood flooring. Laminate flooring is the cheapest option. The average cost of hardwood flooring installation per square metre comes to £65. In the installation are included both the materials and labour. The average cost of installation per room (16.3 square metres) in the UK comes to £1,080 (730 materials, 350 labour). Laminate flooring, is a piece of MDF with a photographic image of wood grain adhered to the surface. It is also the cheapest version of a wooden floor. Cheaper than hard-wood and carpet. Laminate flooring is sold in a wide variety of wood, stone, and tile finishes. Resistant to stains, impacts and scratches. Ideal for people that suffer from dust allergies. Requires the use of a special laminate flooring cleaner. Does not tolerate standing pools of water and heavy moisture. Laminate wood planks are very difficult to repair. Proper installation take some skill to achieve a great looking floor. Engineered wood flooring, often called composite wood flooring is made from wood fibres and other materials that are glued together to form a solid layer that is strong and durable. Great looks! Looks like real wood. Engineered wood expands and contracts less than solid wood. Suitable for wet areas such as bathrooms and laundries. It is very durable and ideal for heavy footfall in both domestic and commercial environments. It can be sanded, which allows to be repaired and refinished. Comes available in wider boards than solid wood flooring. Quality of materials used in production (depends on manufacturer). Health issues can be caused by the adhesives used to bind the layers of the engineered flooring. Solid wood flooring is made from planks of timber that are nailed to a permanent floor. Some wooden floors are floated over the permanent floor and others are made from thicker planks of natural timber. This is the most expensive wood flooring. Straight-forward installation for those with the right experience. Hardwood floors are very easy to clean (they do not accumulate dirt, dust and debris). The Combine high-end aesthetic and style. High quality hardwood floors are very durable and long lasting when manufactured, installed, and finished to certain standards. Hard wood flooring increases the value of the property in the long-term. Hardwood floors come in a wide variety of colors and styles. Great choice for allergy sufferers and healthy indoor air quality. High cost of installation ,deriving from the quality of materials and the expertise of installation. They do not absorb heat, light and noise easily. Solid wood floors need refinishing occasionally as they are very easy to scratch. For those who have pets, hardwood floors might not be the best choice; however, if you are looking for solid wood, be aware that some hardwood floors are more durable than others. To keep the wood from permanent damage, clean up any liquids immediately. Wood flooring prices vary depending on the type chosen and in the case of solid wood, the wood chosen and the thickness. Another major benefit of wood is that it is an eco-friendly, natural and sustainable resource which is very hard wearing. In fact, if maintained well, a hard wood floor could last a lifetime and is attractive to home buyers – a survey by woodflooring.org found that 58% of estate agents questioned said homes with wooden floors are more profitable than ones without. Wood is also a hygienic flooring choice; according to the Environment, Health and Safety Online, nearly 100,000 dust mites live in a square yard of carpet, which can irritate allergies and respiratory conditions like asthma. A wood floor however, is easier to clean and keep dust free. How much is a hardwood floor installation? The cost of hardwood floor installation starts from £22 per square meter and can go up to £60, depending on the specifics of your home. The average cost for materials for a middle sized room is about £400. To get a clear picture of the installation costs, we encourage you to request as many quotes as possible from local experts. Make sure to submit detailed project specifications and have the experts visit your home to examine the space in detail before they make an offer. Before ordering hardwood floor, consult with the professional you hired about how much hardwood floor supply you need to cover your floor space. Usually, you will be advised to order additional 5%-15%, for filling in gaps and awkward spaces. However, according to our experience, ordering 10% – 15% additional supply ensures that there will be no delay in the project, in case you run out of material. It will also help saving money by avoid paying the installers extra money for the working hours or days the spent until the new supplies arrive. Before installing a new wooden floor you will need to clear the room, pull up the old carpet and dispose it. This is not a very difficult job to do, so if you are looking to save money, this is a good way to start. However, if you do not feel like doing it yourself, you can always hire a carpet removal company to remove and dispose your unwanted carpet safely and efficiently. They will remove the old carpet along with tack strips, glue and stapled-down padding that was used when the carpet was first fitted in the room. When wooden flooring is installed the existing skirting needs to be removed and then thrown away. Only after the existing skirting has been removed, only then the floorboards can be laid all across the room, the new skirting can be applied and the threshold strips can be attached directly to the wall. Again this is a job that can be done by you if you want to save money. If you are trying to cut down the cost, installing the underlay yourself can certainly help. The floor needs to be level before the wooden floorboards can be laid. On concrete foundations you can use either a self-levelling compound or a damp proof membrane. On different types of foundations you simply use foam underlay, which is also easy to roll it out and cut it to shape. Always allow a few days for the room to settle before fitting the flooring. The thickness of the underlay ranges from 2mm to 5.5 mm and depends on its function. For instance, different underlay is required when there is underfloor heating than when you need to combat dampness. When you are looking at the wooden flooring installation cost in your home, a solid wood floor can be stained or have a coloured finish. It can be left raw and then sealed to give a natural warm feeling to a room or stained to match other decor and floor coverings. Buying and bringing the wood flooring home on your own is one way to save on your budget. The only thing the contractor has to do is the actual installation. Comparing prices: When you come across a type of wood, color and style to suit your needs, look at similar kinds online, at discount flooring stores and at local retailers to find the best possible price. Obtaining a few quotes: How much will the actual installation cost? Always get at least three quotes for installation from contractors who are licensed and insured. You can then make an informed decision. Minimizing labor costs: Taking out and disposing old flooring and having the room clear of furniture etc. will reduce costs as contractors usually charge extra for doing this kind of service. Glue together. On the tongue of every board, apply a bead of glue and tap into position. Fasten it. Secure boards to current flooring with a rental compressor and floor stapler. Glue down. Similar to tiling, place boards on glue. Click and lock. The tongues and grooves click to each other. It’s fast and tidy. Sanding or finishing is not required for the installation of prefinished floors, which make them ideal for DIY projects. If there are issues, you are covered by a 20-year warranty; therefore, you can get assistance without having to pay outlandish fees. The downside is that these floors can’t be sanded as often which make them challenging to maintain. There are many risks involved if you don’t have a floating floor that is click and lock, therefore installing it on your own isn’t recommended. DIY installation isn’t recommended for glue-down or nailed down hardwood floors due to the mess involved. Room Design: Rooms with irregular shapes are challenging when installing straight planks given that you will only be able to cut it once. Therefore, if it isn’t long enough, placing a piece back will make the job look awful. Budget: Although a DIY installation might save you money, shelling out hundreds for repairs after a bad installation isn’t worth it. Having to replace a floor due to cracking or bulging from humidity isn’t the best way to save money. 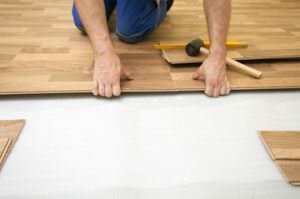 Although you want to do your own DIY installation on your floor, click and lock flooring requires specialized skills and what you save initially you might have to pay even more in repairs down the road. Once you have a budget and know what kind of floor you want to install, contact a flooring expert for professional advice. One option to save money is to serve as a helper to the contractor. Flooring, Flooring Wooden flooring installation cost 2019?